Winter week begins Monday, Dec. 3 through Dec. 7. 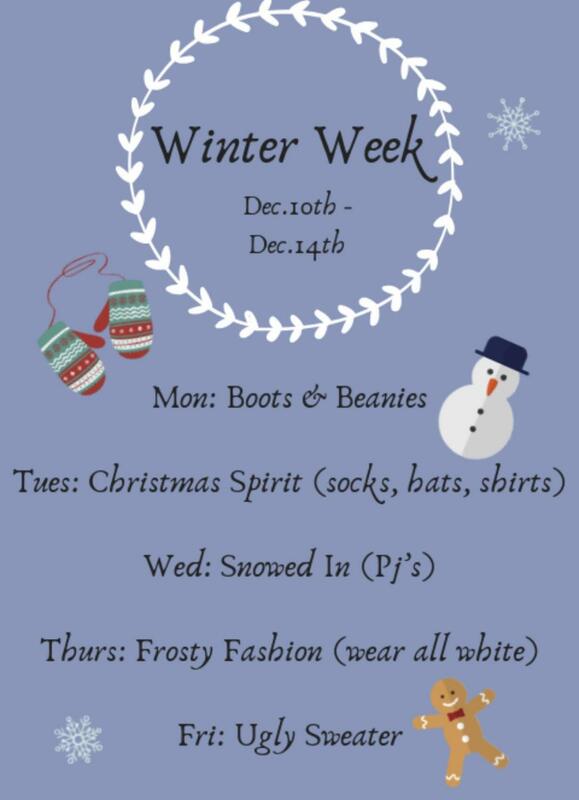 Monday will be “Boots & Beanies.” Tuesday’s dress up day will be “Christmas Spirit,” so wear any socks, hats, shirts that are Christmas-related. Wednesday will be “Snowed In,” students are asked to wear their pajamas. Thursday’s theme will be “Frosty Fashion” (wear all white). To end the week, Ugly sweaters will be worn on Friday. Human Element will be making posters like they did for decade week, so dress up and take take pictures by the posters!